VandenBerg jewelers, roots in the past…eyes in the future. It was 1923, young Bert VandenBerg declined to join some friends that were buying out an established Grand Rapids jewelry store. Instead, looking to the future of his family, he chose to go it alone and created VandenBerg Jewelers. Through the depression, neighborhood changes, World War, and booming economy, Bert charted a course in his neighborhood store at Division and Franklin, of good value and customer relations that made him successful and popular. He believed that if you were conservative on the business, during the depression they left the main lights off until customers came in the store, you could do more for your customer. Credit was arranged with a handshake on literally a dollar down and a dollar a week basis. Bert would not be comfortable in today’s world of give the breaks to attract new customers while taking the old for granted. He took care of his “family” of customers first and waited for the new ones to come. 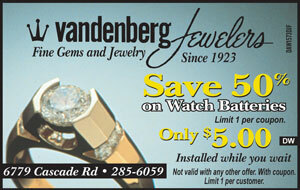 That is why VandenBerg Jewelers has generations of buyers and word of mouth is still our prime advertisement. His sons, Don, Charles and Roy joined him in the business, following his road map while adding a stamp of their own. New products such as the little known Rolex watches and customized jewelry were added to the mix and the store became city-wide moving downtown. The finest manufacturers in all phases of the industry could be found at VandenBerg’s, coupled, of course, with the focus on the customer taught by their father. Another generation of both jewelers and customers joined to add to the VandenBerg Family. Today, Charles’ sons, Chuck Jr. and Greg carry on the tradition of personal service, good value and professional integrity that the VandenBerg Customer Family has come to expect. Like the proceeding generation, Chuck and Greg, have fine tuned the old while bringing new talents to the mix. Now the focus is on giving the VandenBerg customer a look that sets them apart from the crowd. Today, personal design not big-box manufacturing is the way to give more to your customer. Greg and Chuck are intimately trained for this role. Not blind to popular looks, but not slave to them. Both VandenBergs are trained metalsmiths, sharp on gems and bred to the jewelry trade and customer service. We think Bert would be proud of his 1923 gamble to go it alone.